All parts of Thursday's dinner were frozen at some point. Light of my life, fired up pork tenderloin. My sin, my soul. 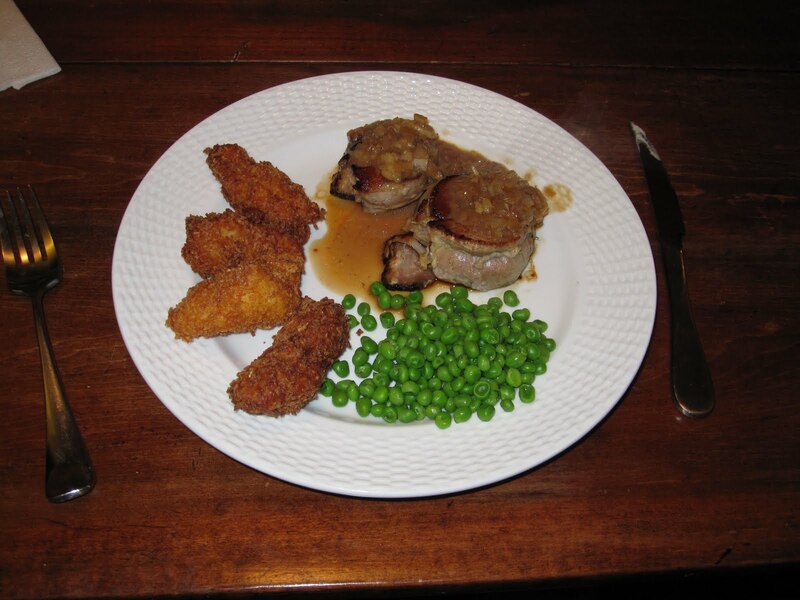 This is the only perfect recipe I have found for pork tenderloin. Before it, tenderloin was just a serviceable piece of meat for making a quick meal. Sliced thin, it made sweet and sour pork more elegant, and pounded between sheets of wax paper it went well with nam pla and a little Thai red curry paste. But roast tenderloin was a bit trickier. Tenderloins are thin and taper at one end, so they’re easy to overcook or cook unevenly. Pork tenderloin is also fat impaired. Bourdain’s solution is as simple as it is elegant. Just tie two tenderloins together. Slather one tenderloin with roasted garlic and a slice of bacon (maybe two) and place the other tenderloin on top with the “tails” facing in opposite directions. Tie it all up with twine, and the result looks more like a loin, but is far more tender and tasty. All that bacon and garlic melts into the meat and contributes to a great pan sauce. I portion a double tenderloin into three meals and freeze two. Slicing them into medallions before cooking is a little less risky when you're thawing them. Pommes dauphine can best be described as crisp potato puffs: you boil and mash potatoes, combine them with pâte-à-choux (the basic batter used in cheese puffs and cream puffs) and drop spoonfuls of the mixture into hot oil. The resulting croquettes boast a thin, delicate crust that shatters against the roof of your mouth, revealing a cloudlike heart. Ask any Frenchman about the pommes dauphine of his youth, and you’ll soon realize you’ve struck quite high on the scale of French comfort food. What I did in this case was pull some leftover Alexia frozen mashed potatoes from the fridge, make some pâte-à-choux and make Michael Symon's "Crab Tater Tots," minus the crab and with crushed Corn Chex instead of panko breadcrumbs. It is the first time I've tried this and it was a major win. They're not fussy to fry and can sit on a table a little longer than fries or chips. Fun to make. Then just some frozen peas with a little butter. All done in under an hour.